I teach in a simple way how to play the melody line (right hand) of Mary Had a Little Lamb, the first part. I also show the notes for this song (first part). The video for the second part is below. 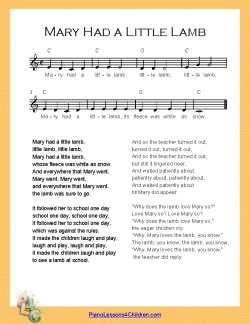 Here is a printable sheet music (PDF file) for the song "Mary Had a Little Lamb". It has notes, chord symbols, and the lyrics. Use it while studying these lessons. This is the lesson for the second part. I also explain the notes for this song in the video. After learning the Mary song, it is time to study chords. If you don't know what CHORDS are, please study this beginner piano lesson about chords, before going forward. Lastly, once you can play the melody of "Mary Had a Little Lamb", you are ready for this beginner piano lesson where I teach how to play this song with chords (for the left hand). We use just two simple chords: C major and G major. Use the sheet music above on this page.